AS THE CAMPAIGN for the presidential election hits the home stretch, check out where you can meet the candidates today. Davis is due to meet with students of the Carlow Institute of Technology at 3.15 before, finally, canvassing at TescoShopping Centre in Naas, Co Kildare, at 4.30pm. Seán Gallagher will be on walkabout on Main Street in Kilkenny from 4pm, after which he will travel to Waterford. While in the city he will visit Dooley’s Hotel on the Quay at 6.10pm and Ardkeen Stores at 7pm before heading to the Grand Hotel in Tramore for 7.30pm. Michael D Higgins will meet with students in DIT, Aungier Street in Dublin at 12 noon, before taking part in the final formal press conference of the Presidential Campaign at Alexander Hotel, Fenian Street, Dublin, at 2pm. Higgins will then travel to Carlow, where he will visit Gaelcholáiste Ceatharlach at 4pm, before heading to Kilkenny to go walkabout at 5.15pm. He will travel to Waterford to meet with WIT students at 6pm and then head to Cork city to meet supporters in the Imperial Hotel at 8.30pm. Gay Mitchell will arrive at Our Lady of Good Counsel Primary School, Drimnagh, at 10.30am and then head to The Base, Ballyfermot, to meet students at 11.15am. Mitchell will then travel to the Bulfin Court Senior Citizens complex for 12.30; go on walkabout in Inchicore from 2pm; meet with parents and pupils at the Assumption Girls’ School in Walkinstown at 2.25pm; travel to Ashleaf Shopping Centre for 3pm; and then go walkabout at 3.45pm around Superquinn in Kimmage Village. He will then arrive at Galtymore shops at 4.35pm and, finally, canvass at the Heuston Station Luas stop at 5pm. David Norris will head to Trust in Dublin 8 for 11.15 before canvassing at the Ilac Centre from 12.45. He will then travel to Dundrum Shopping Centre and finally to The Square in Tallaght, where he will stay from 5.00 – 6.00pm. Dana Rosemary Scallon is due to arrive in Drogheda Town Centre on West Street at 10am, before heading to Navan Town Centre on Kennedy Road for 11am. From there, she will travel to the Franham Arms Hotel in Cavan for 12.30pm; the Longford Arms in Longford for 2pm; and finally arriving at Athlone town centre for 4pm. Details on the appointments of Martin McGuinness were not available at time of publication. 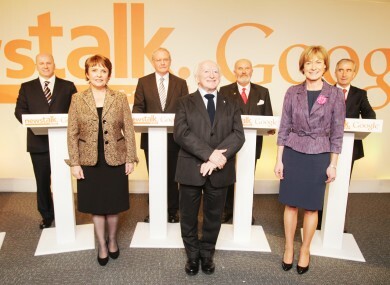 Email “#Aras11 diary: Where the candidates will be today”. Feedback on “#Aras11 diary: Where the candidates will be today”.